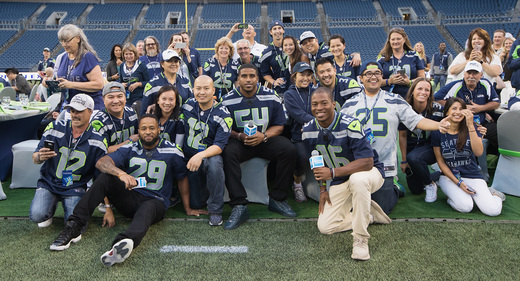 American Express and the Seattle Seahawks hosted a “Dinner on the 50,” event for loyal Hawks fans at CenturyLink Field to pump up the world’s loudest fans named the 12s for upcoming 2016 NFL regular season games inside one of the league’s loudest stadiums. Several hundred special 12thman fans in attendance at the “American Express Dinner on the 50” had the pleasure of a one-of-a-kind dining experience held on the 50 yard line of the stadium. The Sports Techie community blog began operations in the Emerald City in Washington State before moving to Atlanta, GA. Read our exclusive Q&A with Deborah Curtis, VP of Entertainment Marketing & Sponsorships, American Express, below. I especially like to share compelling sports technology, business, art, culture, and entertainment, fan and team related news and stories. 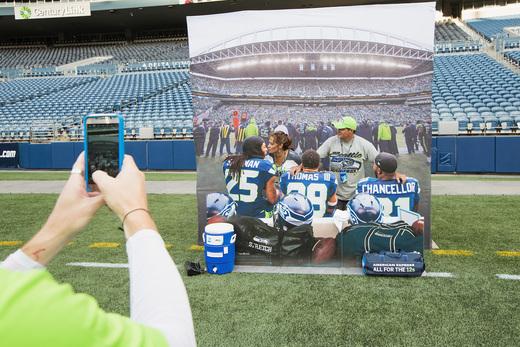 In this case, Dinner on the 50, fan selfies, player discussions and the social media hashtag, #AmexSeahawks. 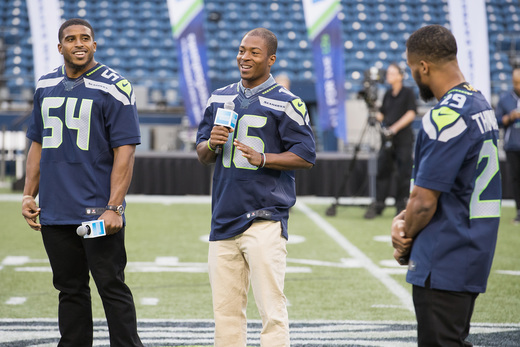 NFL All-Pro Earl Thomas, Bobby Wagner and Tyler Lockett, and fellow 12s, image via Mat Heyward / Getty Images for American Express. Growing up in the Seattle suburbs of Redmond and living about a decade in Ballard as a diehard Seahawks fan, I had friends that attended this exclusive and sold out event last Friday night. All the events proceeds were donated to the local Seattle chapter of the YMCA. The business relationship between American Express and the YMCA was highlighted by this community program, one of many marketing activation’s across the nation for card members, merchants and sport partners. 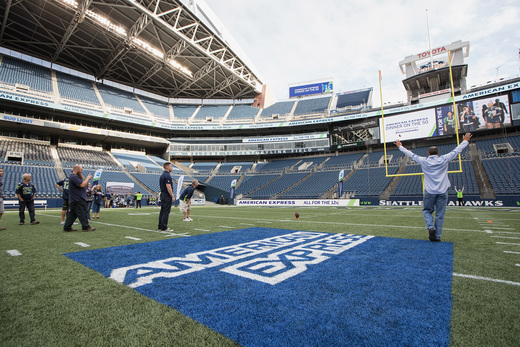 American Express And Seattle Seahawks Host “Dinner on the 50” on CenturyLink Field – SportsTechie blog, image via Mat Heyward / Getty Images for American Express. 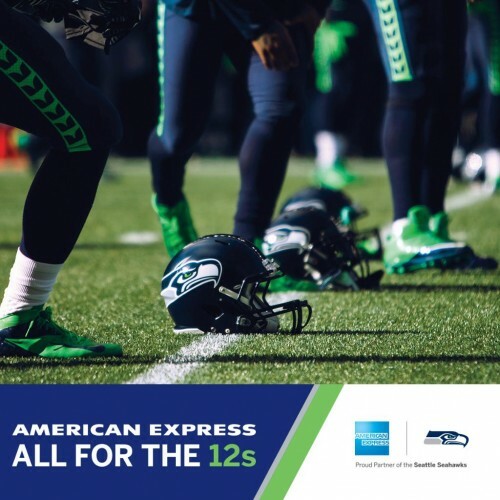 Seattle Seahawks and American Express announced a multi-year partnership last season to drive fan excitement and value to passionate Seahawks fans worldwide. These unique offers, fandom experiences and benefits for members are meant to be lifetime experiences. All “Dinner on the 50” proceeds of the event were donated to the local Seattle chapter of the YMCA image via Mat Heyward / Getty Images for American Express. 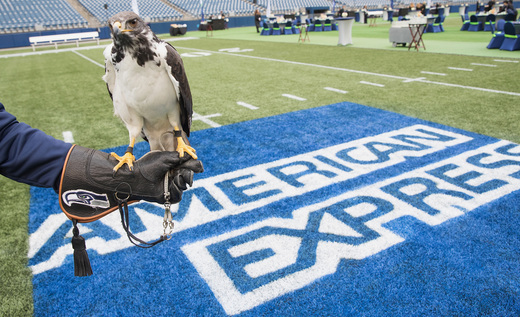 American Express and the Seattle Seahawks hosted a “Dinner on the 50,” event for loyal fans at CenturyLink Field, Taima the Hawk image via Mat Heyward / Getty Images for American Express. One of my favorite American Express photos of the night taken by Getty Images is of a lucky Hawks fan attempting to kick a football through the uprights while one of the two CenturyLink Field big screens displaying live event images displaying the amazing fan experience to fellow 12s in attendance. 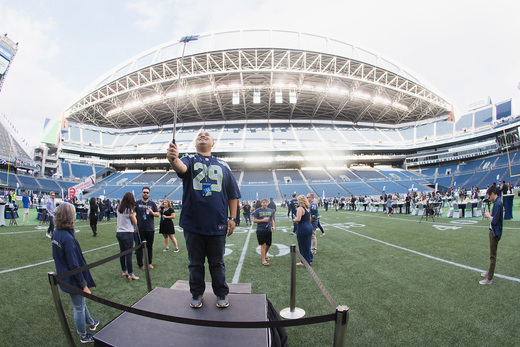 AMEX kicked off the second year of its partnership with the Seattle Seahawks and get the 12s pumped up for the upcoming season, American Express hosted a few hundred fans for “American Express Dinner on the 50,” image via Mat Heyward / Getty Images for American Express. 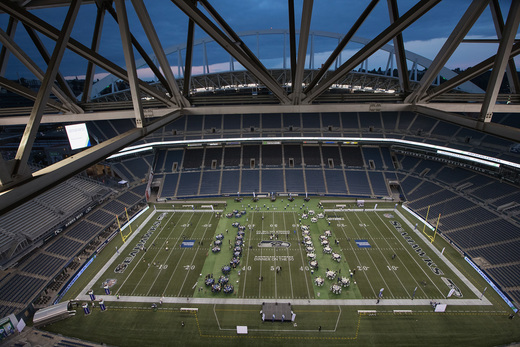 American Express Hosts “Dinner on the 50” on CenturyLink Field. Sports Techie, our family joined the Cowart Family/Ashford Dunwoody YMCA a few weeks ago and love the renovated facility, especially the swimming pool because our three-year old son is on the autism spectrum and learning how to swim. Many of our Sports Techie readers and followers are happy YMCA members too. The AMEX and Seahawks “Dinner on the 50,” was a terrific fan-centric opportunity benefiting both the 12s and Seattle Y. 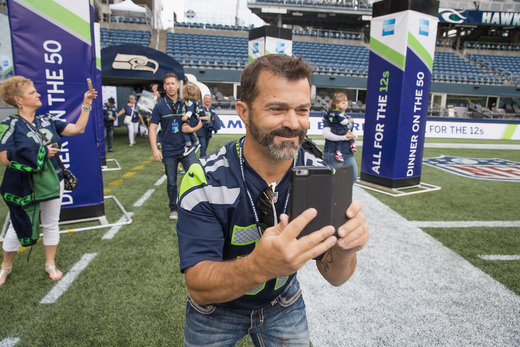 Event pictures highlight the fun experience had by all documented by countless smartphone and tablet selfies shared across social platforms, fan engagement with Seahawks players, and interactive functions for 12s around the stadium. The Seahawks begin play week one, Sunday, Sept. 11th at 1:05 PDT in Seattle versus the Miami Dolphins at CLink stadium in an AFC matchup. The first Hawks home game will be televised on CBS Sports. Look for additional AMEX and Seahawks fan experience programs as the season progresses, in addition to other sport and league sponsorship programs we look forward to sharing with everyone in the future.